Snowman Making fun with Franklin County Sheriff’s Department! Alex getting dinner ready for the students. Ben Defroscia, Patrol Director from Sugarloaf, Jeff Lecander, Maintenance Technician and AJ Beaulier painter and business owner visited Mrs. Lecander’s 2nd grade class to speak to the students about their work and training. 11/7/17 The Hampstead Theater players presents “Robin Hood”! 10/21/17 Lady Bobcats go to the championship! 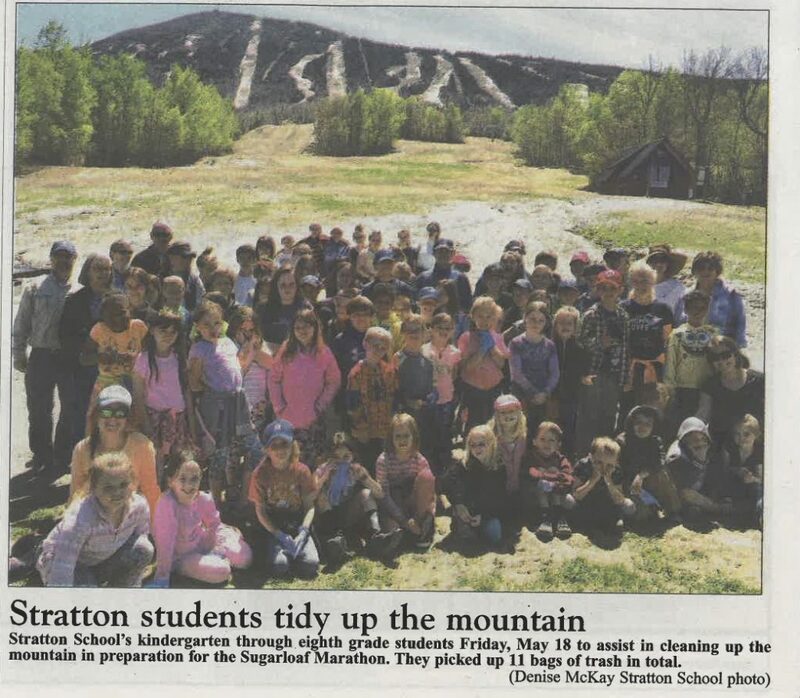 Stratton School brings home the cup. The Trivia team wins 1st place! 6/14/17 Our K-4th graders enjoyed a fun and beautiful day on Flagstaff Lake today! First grader, Lylah Schanz’s drawing won first place for her age group in the “Be Tick Smart”program which is aimed at raising awareness about Lyme Disease. Her drawing will be hung at the Center for Disease Control (CDC) in the Augusta branch. Lylah was given a state park summer pass. Seventh grader, Noah Koenig won honorable mention for his drawing which will also be on display at the CDC. Both students won certificates. Congratulations! Eli Fournier won 3rd place overall and 3rd place technical . His car name- Triple Crown. Evan Downing, Noah Koenig and William DeFroscia’s car won 2nd place overall. Part of the end result. Wesley as Martin Luther King Jr.
3/29/17 Laura Qynn from Healthy Community Coalition helped us jumpstart our school garden project! 3/27/17 A visit from the Men’s US Ski Team! Students created this banner with the help of Millie & Mrs. Logan. 3/24/17 The Pepin’s visited our school to treat everyone to maple taffy! 3/24/17 Making homemade butter for pancakes and maple syrup in kindergarten. 3/24/17 A lesson about King George and “Taxation without Representation” in Mrs. Beers’ 4th grade class. Students were given “money” (Froot Loops) and made to pay “taxes” in Froot Loops for things like: being left handed or having laced shoes and so on. SAST (Sugarloaf Area Ski Team) 2016 – 2017 Season. Boys finished 4th overall. Jake Tyler finished 2nd in GS at State Finals. End of year party. Thanks Jim & Hope Wilson! Published in the Sun Journal! 3/7/17 Physical Education with Mr. Brown. Ice Skates were generously donated by the Carol M. White Physical Education Program (PEP) Grant. Skating rink was generously donated by the Brochu family. Many thanks to the Brochu Family for creating this skating rink! March 2, 2017 Dr. Seuss’s Birthday Celebration!! Mr. Brown works with the Pre K students. Mrs. Beers’ 4th grade Energy Bus – positivity in motion! Mrs. Logan, our art teacher, works with the Pre K.
Sharon & Peter Farnsworth one of our favorite couples from our community.